Click PLAY on the above video to experience Education Hub Wexford and its environs. At a March 18, 2019, ceremony on its Armstrong Campus, on the Southside of the City of Savannah, Georgia Southern University formally announced the establishment of the University’s first overseas Learning Hub. GEORGIA SOUTHERN UNIVERSITY - IRELAND is located in a landmark historic building in Wexford Town, the county seat of County Wexford (the “Model County”) in Southeastern Ireland. During the mid-nineteenth century, thousands of emigrants sailed to forge new lives in Savannah, Georgia, departing from the ocean port of Wexford Town and the river port of New Ross, also in County Wexford. The Wexford-to-Savannah passage was non-stop across the North Atlantic Ocean, with three-masted vessels, known as barques, taking between six and eight weeks to complete the route, which skirted the Azores and Bermuda. Above: An advertisement for emigration from Wexford Town to Savannah, from a September 1850 issue of the Wexford Independent newspaper (image courtesy of the Wexford County Archive ©). The ad was placed by the shipping company, R., M., and R. Allen, which was headed by three Quaker brothers and based in Wexford Town. Various Allen vessels operated the Wexford-to-Savannah route: the Brothers; the Menapia; the Wexford. Each of Ireland’s 32 traditional counties is represented among Savannah’s Irish diaspora; however, during “prime time” for Irish emigration to the “Hostess City,” — 1849 to the mid-1850s — 56% of new arrivals had departed from County Wexford. To this day, family names associated with County Wexford abound in Savannah: Corish, Doyle, Kehoe, Redmond, Rossiter, Sinnott, Stafford, and more. The Wexford vessels afforded healthy passage to Savannah, with captains regularly receiving kudos from passengers. Once in Savannah, the welcome was notable. In its issue of December 6, 1850, the Savannah Morning News offered the editorial comment that “rarely … [do] we see a more respectable body of new comers from any portion of Europe, than those [from Wexford] …. May they realize their brightest anticipations, of prosperity and happiness in their new home.” According to federal census data, by 1860 almost a quarter of Savannah’s non-slave population was Irish-born. Above left: As a December 1850 Savannah Morning News editorial comment underscores, mid-nineteenth-century Savannah keenly welcomed both female and male immigrants from Wexford. Early in 1851, a newcomer named McLaughlin, from Wexford Town, wrote home to his father, averring, “Every passenger was engaged before he left the vessel …. This [Savannah] is the finest city I was ever in.” • Above right: The Wexford-Savannah Axis research project was launched at Georgia Southern University on March 18, 2014, by the Irish politician, Leo E. Varadkar, who has since become Taoiseach (Prime Minister) of Ireland. Five years later, to the day, the University’s President, Shelley C. Nickel, announced the establishment of the Georgia Southern University - Ireland facility in Wexford Town. Life in Savannah was not without challenges for immigrants from Wexford and other parts of Ireland. A yellow-fever epidemic in August and September of 1854 claimed hundreds of Irish lives, including that of Daniel Kehoe, aged 47, from Mounthoward, near Gorey, County Wexford. One of Daniel’s sons, William, would go on to develop Kehoe’s Iron Works in Savannah’s Old Fort neighborhood. By 1916, it was the largest such facility in the United States, south of the shipbuilding city of Newport News, Virginia. Two Wexford immigrants, the Catholic priest, Peter Whelan (from Loughnageer, near Clongeen), and the Protestant physician, Richard Joseph Nunn (from Wexford Town), gained immense popular respect in Savannah as selfless humanitarians. Their respective funerals remain among the largest in Savannah’s history. Today, Savannah, Georgia, stages the second-largest (and the best) St. Patrick’s Day Parade in the United States, with the flag of County Wexford gracing the joyous celebration. Several superb outcomes have resulted from the Wexford-Savannah Axis research project, which has successfully reconnected two communities after 170 years. Coming to know each other once again affords both regions exciting, future-directed opportunities as regards education, culture, the arts, tourism, and — crucially — economic development. Conscious that investment follows trade, in March 2018 business and government leaders in both communities followed up on several transatlantic visits by establishing Wexford-Savannah TradeBridge as a platform to help businesses in Southeast Ireland and Coastal Georgia gain access to each other’s markets. Ireland is a world-leading economy in such areas as informational technology, biopharmaceuticals, and medical devices; and soon it will be the only English-speaking member of the European Union. Savannah boasts the fourth-largest (and the fastest-growing) container port in the United States, as well as being a major center for distribution logistics, aircraft manufacture, and film production. During its first year, TradeBridge delivered impressive results, such as a major Southeastern US distribution deal for Survipod, a Wexford manufacturer of innovative surveying tools. In addition, the Savannah Bee Company contracted broad-based entry into Ireland and the EU. Recently, Raceix, an Irish company in the motor-boat tech sector, credited TradeBridge when announcing Savannah as its choice for its North American headquarters. Other achievements could be detailed, too. Due to visionary strategic leadership from Wexford County Council in response to the Wexford-Savannah Axis research project and the TradeBridge initiative, one of the Council’s properties has been made available to Georgia Southern University. Founded in 1906 and maintaining campuses in the Georgia cities of Savannah, Statesboro, and Hinesville, Georgia Southern is an R-2 (high research productivity) institution with a student population in excess of 26,500. With degree programs through the doctoral level, Georgia Southern constitutes the largest comprehensive university in the State of Georgia south of the Metropolitan Atlanta region. Georgia Southern is a unit of the University System of Georgia, whose total enrollment exceeds 328,700 students. Above: The interior of Georgia Southern University - Ireland exhibits fine architectural features that deliver a sense of historical grandeur. The University intends to use the space in a manner inclusive of the local community, offering public events, such as lectures and performances, that establish a collaborative culture of mutual enrichment. Georgia Southern University - Ireland occupies customized space in a landmark edifice that formerly served as Wexford County Hall. Dating to 1812, the principal building is a fine example of the Georgian style of architecture, executed in red sandstone with granite dressings. Sensitively reconfigured to incorporate twenty-first-century instructional assets, the building’s interior provides a variety of highly effective learning environments. From this base, students from Georgia Southern and the greater University System of Georgia benefit from the superior networks present in County Wexford and Southeast Ireland — from Ireland’s National Opera House, just blocks from campus, to the United Nations-endorsed Center of Excellence in nZEB (nearly zero energy building), located in the nearby town of Enniscorthy. • Éamonn Murphy, Chair, Wexford Enterprise Center, and his wife, Clare Murphy. • Howard Keeley, PhD, Director, Center for Irish Research and Teaching, Georgia Southern University. Above: Once the Announcement Event occurred, the homepage of Georgia Southern University led with the Learning Center in Wexford Town. Via its primary outward-facing forum, the University celebrated the first time in its 113-year history that it has had an overseas facility. An article in Georgia Southern Magazine, a high-quality print publication, will be forthcoming. Multiple Savannah political, business, educational, and religious leaders attended the Announcement Event, and a pictorial sampling of those present concludes this webpage. First, though, we offer links to media coverage of the occasion, plus other related material. Click HERE or on the image above to read Georgia Southern University’s official press release. Click HERE or on the image above to read the online version of coverage by the Savannah Morning News. The reporter was DeAnn Komanecky. A similar article appeared in the print edition of the newspaper on Tuesday, March 19, 2019. Click HERE or on the image above to watch the TV report from WTOC Savannah (CBS affiliate). Click HERE or on the image above to watch the TV report from WSAV Savannah (NBC affiliate). Click HERE or on the image above to watch the TV report from Fox 28 Savannah. Click HERE or on the image above to watch the TV report from WJCL Savannah (ABC affiliate). 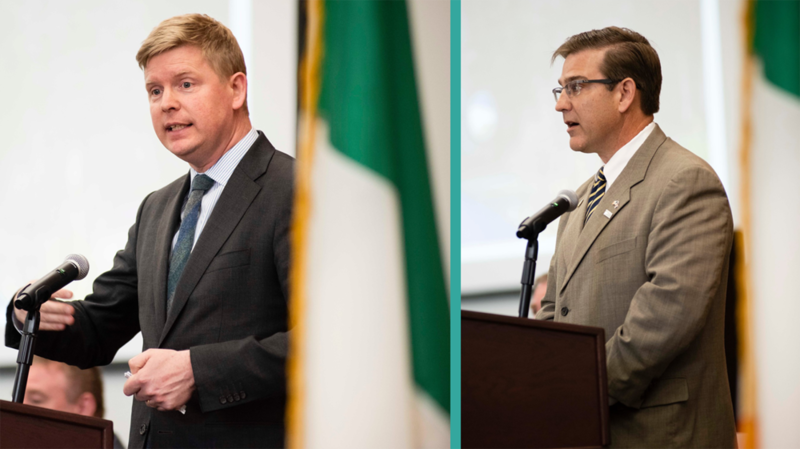 In addition to being guests of honor at the Georgia Southern University - Ireland Announcement Event on Monday, March 18, 2019, the core government representatives from County Wexford enjoyed other high-value opportunities during their visit to Savannah. On Friday, March 15, 2019 — their first full day in the Hostess City — Council Chair Keith Doyle, Wexford Town Mayor Tony Dempsey, and Council Deputy Chief Executive Tony Larkin were hosted to a working lunch by the senior leadership of the Savannah Economic Development Authority. The Wexford delegates then progressed to City Hall, where Savannah’s Mayor, Eddie DeLoach, presented a Key of the City to Doyle, as the representative of County Wexford, and another Key to Dempsey, as the representative of Wexford Town. The City Hall event concluded with a tour of historic artifacts related to Wexford in the collection of the City of Savannah’s Municipal Archives. The Director of Archives, Luciana Spracher, explained the items’ significance. Click HERE or on the image above to experience how WTOC, a Savannah television station, reported the City Hall visit. Doyle, Dempsey, and Larkin next participated in the William Jasper Ceremony, the annual tribute by the Savannah Irish to the United States armed forces. A particular focus is Irish-American service across all branches: Air Force, Army, Coast Guard, Marines, and Navy. At the event, the Wexford party interacted with Representative Buddy Carter, the Member of the United States House of Representatives for the First District of Georgia, which includes Savannah. Above: Scenes from the William Jasper Ceremony. • Left: Members of the United States Air Force Honor Guard, based in Washington, DC, march to Madison Square, Savannah, venue for the Ceremony. • Center: Tony Dempsey, Mayor of Wexford Town, receives recognition from those attending the Ceremony in Madison Square. • Right: Members of the Irish Air Corps Pipe Band perform Ireland’s national anthem as part of the Ceremony. The Wexford representatives concluded their official Friday engagements in Savannah by attending a reception co-hosted by David Stanton, TD, Ireland’s Minister of State for Equality, Immigration, and Integration; Shane Stephens, Ireland’s Consul General for the Southeastern US; and Andrew Staunton, the UK’s Consul General for the Southeastern US. The reception’s theme was America’s role in the peace process on the island of Ireland. The event also highlighted Scots-Irish contributions to the City of Savannah and the State of Georgia. Minister Stanton contributed an op-ed to the March 15, 2019, issue of the Savannah Morning News. The piece recognizes the Wexford-Savannah Axis research project and the Trade Bridge initiative, and it also states that “an exciting new chapter in the relationship between Ireland and Georgia Southern University will soon be unveiled.” You can read the op-ed HERE. As St. Patrick’s Day 2019 fell on a Sunday, Savannah held its Parade the day before. The Savannah St. Patrick’s Day Parade Committee accorded VIP status to the Chair of Wexford County Council, Keith Doyle, and the Mayor and First Lady of Wexford Town, Tony and Gemma Dempsey. At 8:00 am on Saturday, March 16, 2019, the Wexford guests attended Mass for the Feast of St. Patrick at the Cathedral of St. John the Baptist, along with Brian Kemp, Governor of the State of Georgia, and Buddy Carter, US Representative for the First District of Georgia. Then, the Parade Committee provided them with an open-top Mercedes, displaying “Co. Wexford, Ireland” signage, in which they participated in the Parade, moving through several of Savannah’s historic squares and along such thoroughfares as Abercorn Street and Bay Street. During the afternoon of St. Patrick’s Day, Keith Doyle, Tony and Gemma Dempsey, and Tony Larkin were joined by Éamonn Murphy, Chair of the Wexford Enterprise Center, and his wife, Clare Murphy. The Wexford visitors enjoyed a tour of selected grave sites in Savannah’s Catholic Cemetery associated with County Wexford. One of their guides was Monsignor William Oliver O’Neill, Vicar General Emeritus of the Diocese of Savannah, who attended St. Peter’s Seminary in Wexford Town. Prior to the Georgia Southern University - Ireland Announcement Event (read the invitation HERE), the Wexford visitors attended a Savannah lunch in honor of County Wexford, hosted by Shane Stephens, Consul General of Ireland for the Southeastern United States. Beginning at 3:00 pm, the Announcement Event attracted over 200 people. To conclude their Savannah trip, the Wexfordians were the honored dinner guests of of Shelley C. Nickel in her capacity as President of Georgia Southern University. In remarks at the meal, Nickel underscored that student research has been central to the revitalization of links between Wexford-Southeast Ireland and Savannah-Coastal Georgia. In reporting on the Announcement Event, the Georgia Historical Society (founded in 1839) also invoked student participation (read the piece HERE). A current phase in the research is the development of Savannah material for inclusion in the visitor experience at the Dunbrody Center in New Ross, County Wexford. This project featured in both the print and online March 14, 2019, editions of the Savannah Morning News. You can read the online content HERE. It is based on an official press release from Georgia Southern University, which you can read HERE. Above: Georgia Southern University’s President, Shelley C. Nickel, led the Announcement Event, held in the Memorial Health Learning Studio of the Armstrong Campus, Savannah, during the afternoon Monday, March 18, 2019. Above: The crowd exceeded 200 people. Above left: The podium speakers included Shane Stephens, Consul General of Ireland for the Southeastern United States. The Irish Government’s Emigrant Support Program has provided $70,000 in funding for Georgia Southern students to research the historical connection between the County of Wexford and the City of Savannah. • Above right: Another podium speaker, John Coleman, represented the Savannah Economic Development Authority (SEDA), of whose Board of Directors he is Vice-Chair. Support from SEDA has been critical to TradeBridge, a initiative that advances trade and investment between Wexford-Southeastern Ireland and Savannah-Coastal Georgia. Above: Fred Sanders, PhD (center), the founding Director of Georgia Southern University’s Center for Irish Research and Teaching, joined the crowd to applaud Georgia Southern University - Ireland and the partnership that precipitated it. Above: Keith Doyle serves as Cathaoirleach (Chair) of Wexford County Council. Realization of Georgia Southern University - Ireland is the result of the Council’s vision and leadership. Doyle masterfully represented County Wexford on the podium at the Announcement Event. Above: As the Regent for the First District of Georgia and the Chair of the Board of Regents of the University System of Georgia, Savannah native Don Waters provided essential guidance and backing to achieve Georgia Southern University - Ireland. Above: Irish and Savannahian stakeholders reacted with enthusiasm as the Announcement Event revealed details about the enhancement of international educational opportunities for Georgia Southern students and faculty members. Above: During his podium remarks, Howard Keeley, PhD, Director of Georgia Southern University’s Center for Irish Research, paid tribute to Dr. Francis P. Rossiter, Jr., MD, a noted leader in Savannah’s Irish community and the great-grandson of two immigrants into the Hostess City from County Wexford. Rossiter’s support of the “Wexford Campus” initiative has been invaluable. Above: Howard Keeley of Georgia Southern (left) expressed gratitude to the attendees. Those he acknowledged from the podium included Roger Moss (center), Director of the Savannah Children’s Choir, which in 2016 chose County Wexford for its tenth anniversary tour. Wexford County Council could not have been more hospitable to the young Savannahians. • Keeley also asked the crowd to salute Angela Coleman (left), the organizational genius most responsible for the success, year after year, of the Savannah St. Patrick’s Day Parade. Above: Mikie Rowe (standing, center) was acknowledged from the podium. A native of County Wexford, he plays professional soccer for South Georgia Tormenta Football Club, which is based in Statesboro, Georgia, and regularly competes in the greater Savannah-Hilton Head region. As a result of the economic-development efforts between Savannah and Wexford, Tormenta has already toured a team in Southeast Ireland; and Darin VanTassel, PhD (bottom left), the club’s CEO, intends more Irish engagements, centered in Wexford. Above: Among those in the front row at the Announcement Event were (left to right): Most Rev. J. Kevin Boland, DD, Bishop Emeritus, Diocese of Savannah; Brian F. Byrne, Assistant Secretary, Savannah St. Patrick’s Day Parade Committee; Lawrence E. (“Bubba”) Edgerly, General Chairman, Savannah St. Patrick’s Day Parade Committee; Gerald P. (“Jerry”) Counihan, Sr., 2019 Grand Marshal, Savannah St. Patrick’s Day Parade; Eddie DeLoach, Mayor, City of Savannah. 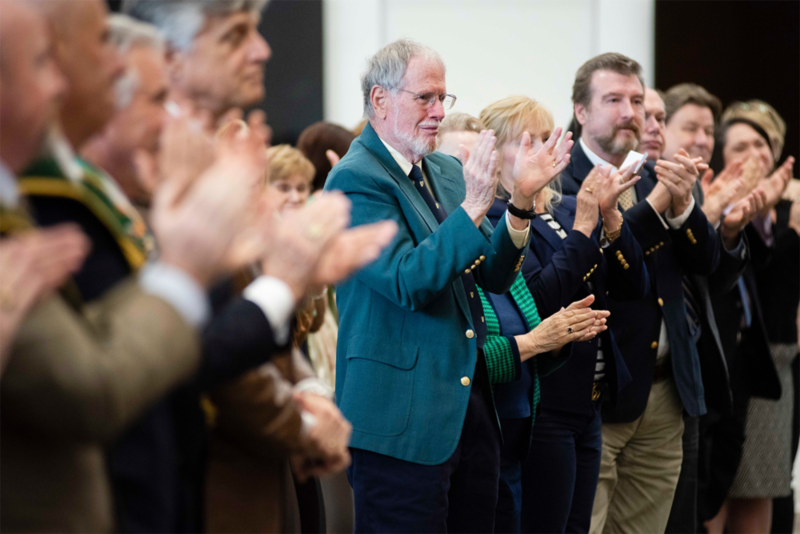 Above: Jerry Counihan responded to the audience’s acknowledgement of his work as the 2019 Grand Marshal of the Savannah St. Patrick’s Day Parade. That role constitutes a high honor for any member of Savannah’s Irish community. 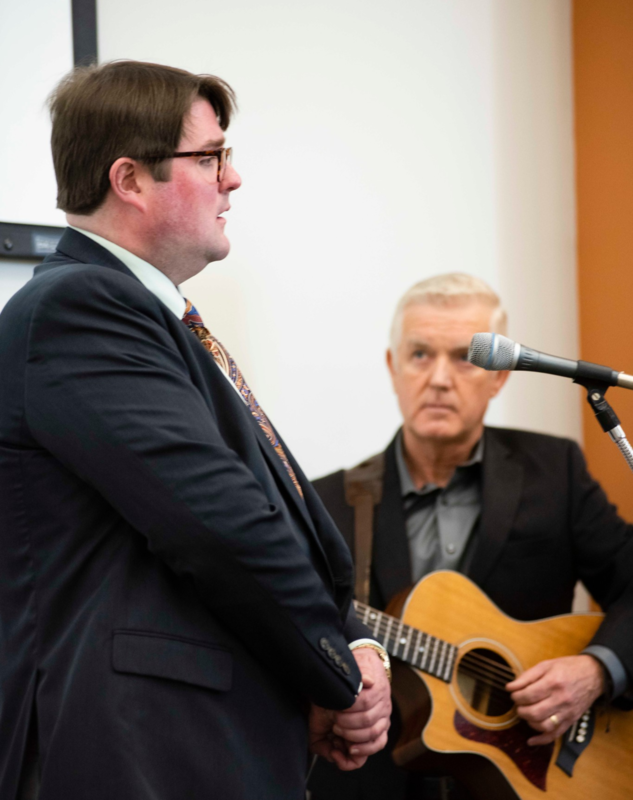 Above: As the Announcement Event reached its conclusion, the multi-talented Harry O’Donoghue, Savannah’s Favorite Irishman, performed “Reasons to Leave,” an evocative ballad written by Kieran Goss. O’Donoghue and other friends raised the funds to endow an Irish Studies scholarship at Georgia Southern University. That award has supported several students who participated in the Wexford-Savannah Axis research project. Above: Bringing the formal part of the Announcement Event to a stirring close, Professor Jonathan Murphy of Georgia Southern University’s Department of Music and Center for Irish Research and Teaching gave a truly memorable performance of “Danny Boy,” accompanied on guitar by Harry O’Donoghue. Above: The audience expressed its appreciation of the musicians. In the center of the photograph is Carl Reiber, PhD, Provost and Vice President for Academic Affairs, Georgia Southern University. To his left (the viewer’s right) sit, in order, Clare Murphy, Éamonn Murphy (Chair, Wexford Enterprise Center), and Steve Green (Past Chair and current board member, Savannah Economic Development Authority). Above: At the reception following the Announcement Event, the First Lady of Wexford Town, Gemma Dempsey (right), conversed with Jessie Bynum (left). In her capacity as Manager of Research and Trade Development at World Trade Center Savannah, the international arm of the Savannah Economic Development Authority, Bynum was central to the development of the Wexford delegation’s mid-March 2019 Savannah itinerary. 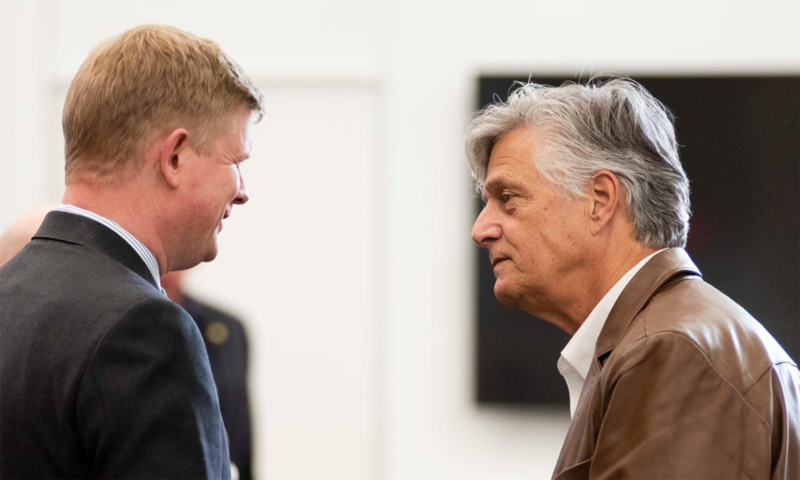 Above: During the reception, Keith Doyle (left), Chair of Wexford County Council, receives a warm greeting from Jerry Counihan (right), the Grand Marshal of the 2019 Savannah St. Patrick’s Day Parade. Above left: Ashley Norris serves as Secretary of the Savannah St. Patrick’s Day Committee. He is a graduate of Georgia Southern University, where he majored in business and minored in Irish Studies. • Above right: Dustin Anderson, PhD, is a valued member of the faculty of the University’s Center for Irish Research and Teaching. In addition, he is an associate professor of literature and the Chair of the Faculty Senate. Above: Three respected Savannah leaders enjoy each other’s company. From left to right — Roger Moss, Director, Savannah Children’s Choir; Don Waters, Chair, Board of Regents, University System of Georgia; Robert Haas, Rabbi, Temple Mickve Israel, Savannah, the third oldest Jewish community in the United States. Above: Wearing his chain of office, the Mayor of Wexford Town, Tony Dempsey (left), connects with the Bishop Emeritus of the Diocese of Savannah, Most Rev. J. Kevin Boland (center), and the Director of the Diocesan Archives, Katy Pereira (right). Above: Our favorite selfie from the reception! The Wexford-Savannah Axis research project has been powered forward thanks to professional help from the outstanding personnel at three Savannah archives. From left to right: Luciana Spracher, Director, City of Savannah Municipal Archives; Katy Pereira, Director, Catholic Diocese of Savannah Archives; Elyse Butler, Historic Marker Manager, Georgia Historical Society; and Pattye Meagher, Director of Communications, Georgia Historical Society. The project is also indebted to Irish archivists: Gráinne Doran, Director, Wexford County Archive, Wexford Town; Brian Dempsey, PhD, Head of Nineteenth-Century Archives, National Archives of Ireland, Dublin. Above left: A scion of immigrants from Wexford who settled in Savannah’s Old Fort neighborhood, Dr. Frank Rossiter, Jr., was the 2014 Grand Marshal of the Savannah St. Patrick’s Day Parade, as well as the 1998-1999 President of the Hibernian Society of Savannah. The Society was founded in 1812, and a dozen years later it organized the city’s first public parade in honor of Ireland’s patron saint. • Above right: Tony Dempsey is the Deputy Chief Executive and the Director of Services, Economic Development and Planning, of Wexford County Council. He and Tom Enright, the Council’s Chief Executive, deserve huge credit for advancing Georgia Southern University - Ireland, and both the University and the citizens of Savannah are grateful to them. Above (left to right): Don Waters, Chair, Board of Regents, University System of Georgia; Éamonn Murphy, Chair, Board of Directors, Wexford Enterprise Center; Trip Addison, Vice President for External Affairs, Georgia Southern University. Above (left to right): John Coleman, Vice-Chair, Board of Directors, Savannah Economic Development Authority; Éamonn Murphy, Chair, Wexford Enterprise Center; Howard Keeley, PhD, Director, Center for Irish Research and Teaching, Georgia Southern University; Pattye Meagher, Director of Communications, Georgia Historical Society; Todd Groce, PhD, President and CEO, Georgia Historical Society; Shelley Nickel, President, Georgia Southern University; Shane Stephens, Consul General of Ireland for the Southeastern United States. Above: Will Lynch, PhD (left), Chair, Department of Chemistry and Biochemistry, Georgia Southern University, and Chris Hagen (right), Past President, Monsignor Daniel J. Bourke Division (#1 Savannah), Ancient Order of Hibernians in America, and Past Vice-Chair, Savannah Irish Festival. Above: Sarah McCarroll, PhD, Associate Professor of Theater and member of the faculty of the Center for Irish Research and Teaching, Georgia Southern University, and Teresa Winterhalter, PhD, Associate Dean, College of Arts and Humanities, Georgia Southern University. Above: Robert P. Grayson (left), President, Irish Heritage Society of Savannah, and Walt Harper (right), President, Monsignor Daniel J. Bourke Division (#1 Savannah), Ancient Order of Hibernians in America. 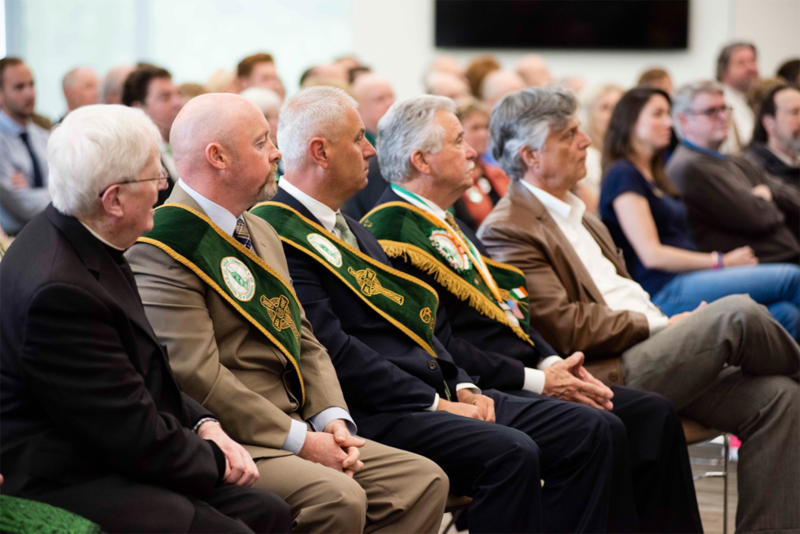 Presidents and other officers of each of Savannah’s 15 Irish organizations attended the Announcement Event. During the reception, they connected in a spirit of camaraderie. Also in attendance were the President and multiple members of the Irish Heritage Society of Sun City-Hilton Head, a community in the state of South Carolina, just north of Savannah. Above: Shane Stephens (left), Consul General of Ireland for the Southeastern United States, discusses Georgia Southern University - Ireland with Eddie DeLoach (right), Mayor of Savannah. The Consul brought greetings and congratulations from Dan Mulhall, Ireland’s Ambassador to the United States, who learned about the project when visiting the Center for Irish Research and Teaching and Savannah in April 2018.